The After-hours time premium (03.01AA) is a great code to use if you’re working late, on weekends or during the holidays. You can use it for a number of patient care activities when you’re working in active treatment hospitals, nursing homes or auxiliary hospitals. Reviewing (but not waiting for lab or DI results). Consulting with other health providers on the service about the patient’s care. Any other physician activities included in managing the patient’s care. 03.01AA is a time-based premium, which means it’s based on 15 minute units. It uses a modifier to indicate the time of day and how many 15 minute units it took. The time of day is represented by letters and the units are represented by numbers. For example, let’s say you started at 10:00pm and finished at 10:45pm, the modifier would read “TNTP03.” TNTP indicates the time of day, and 03 indicates it took 3 units (of 15 minutes). Note: 03.01AA is also billable in addition to other services (at the same encounter) on the same date of service. In the event that one 15-minute period covers two time periods, the modifier claimed will be based on the time period where the majority of the 15-minute period occurred. For example, on a Monday night, if you started at 9:50pm and ended at 10:05pm, you would select TEV01, and not TNTP01 because the majority of the time was spent before 10pm. 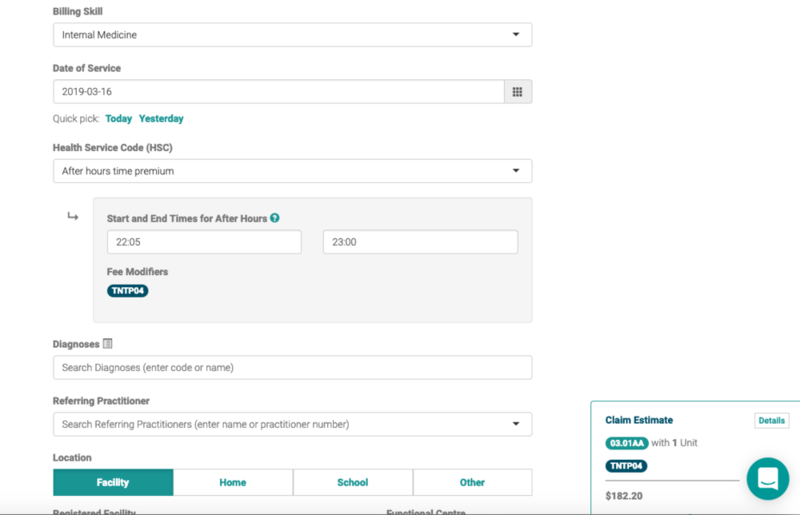 In the event that time spent managing patient care crosses over between two time periods you can select more than one modifier. For example, if you start at 9:00pm and finish at 11:45pm you would claim 03.01AA - TEV04 / TNTP07. In the event that time spent managing patient care crosses over two dates of services then you’ll need to create two separate claims. For example, if you start at 9:00pm on a Saturday and finish at 3:45am on a Sunday then your two claims would look like this: 03.01AA - TEV04 / TNTP08 and 03.01AA- TNTA15. These two examples were taken directly from the Alberta Medical Association. Choose 04 because it covered 4 units (even though it was 3 full units and only 5 minutes into the 4th unit, it always rounds up). · 03.03QA in-patient callback (22:00-24:00). · 03.03DF hospital visit in association with a callback. Choose 03 because it covered 3 units (even though it was 2 full units and only 7 minutes into the 3rd unit, it always rounds up). As with almost everything in the billing world, you need to make sure you match your modifier description and time units exactly, otherwise your claim will get rejected. Therefore, always double check that you’ve chosen the correct modifier for the type of after-hours you did (weekend, nightshift, etc.) and make sure you don’t go over the maximum number of units allowed per modifier (shown in the 4th column in the chart above). 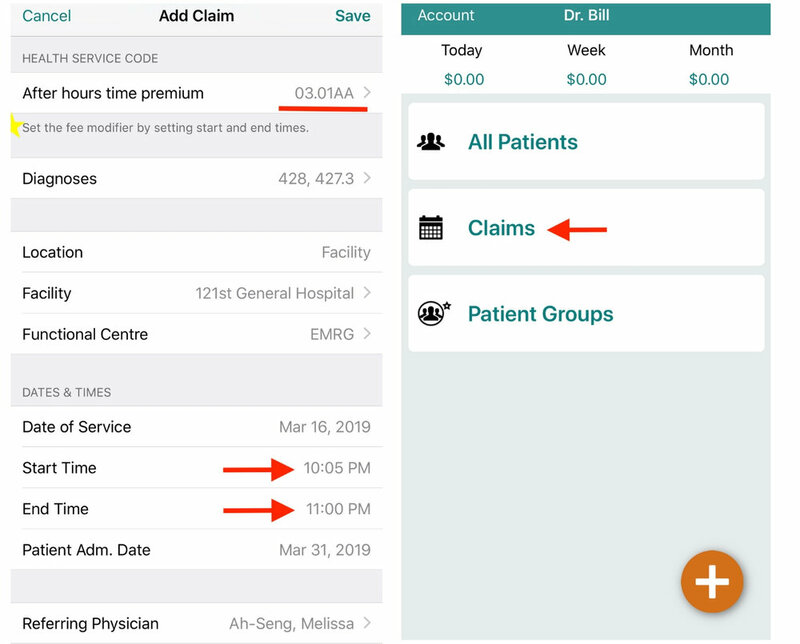 If you have the Dr. Bill App, all you need to do is enter your start and end times and the modifier codes will calculate automatically based on those times. just make sure you add your start and stop times. Then click save (you’re done)! Step 2. If you want to see how much was calculated, click on the “claims” calendar on the front page. Step 3. 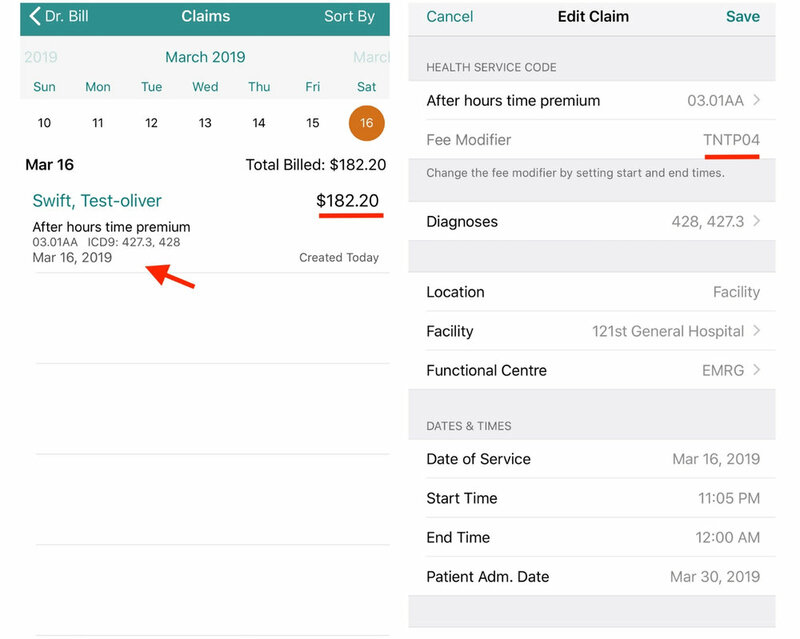 Click on the date of service you created the claim for and you’ll see the $ amount. Step 4. If you want to see the exact modifier that was calculated click on the claim. Explanation: For this example, our start and stop times were 10:05pm - 11:00pm, so the app calculated TNTP (Any Day: 10:00pm – 12:00am) and 04 because it took up 3 full 15 minute units and some of the 4th unit. If you’re billing 03.01AA on the web app, it’s the same process, you just enter in your start and end times and they’ll get calculated automatically. The modifier and $ amount will appear on the bottom right hand corner of the screen. 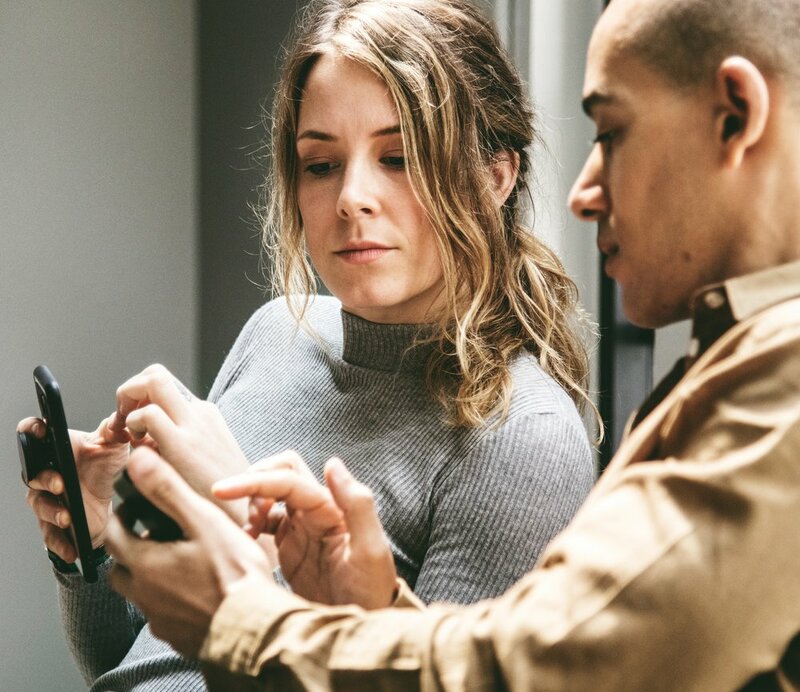 If you have any questions regarding how to bill 03.01AA or how you can get started using Dr. Bill, don’t hesitate to contact us.